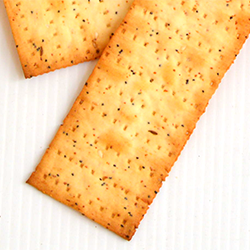 Description: Crispy, flavorful low protein flatbread style cracker thins sprinkled with herbs, caraway seeds, poppy seeds and sesame seeds. A versatile ready to serve snack perfect on their own or with your favorite low protein spread. Serving Suggestions: Eat plain or top with guacamole, salsa and cheddar shreds. Storage: Store in a cool, dry place. Once opened, store sealed to preserve freshness. Ingredients: Tapioca starch, water, potato starch, potato flour, expeller pressed palm oil, natural vinegar, honey, egg yolks, salt, garlic flakes, caraway seeds, poppy seeds, sesame seeds. Contains eggs. Also contains seeds.